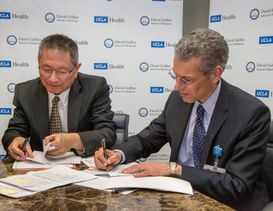 UCLA Health System for more than half a century has provided the best in health care and the latest in medical technology to the people of Los Angeles and the world. Comprising Ronald Reagan UCLA Medical Center; UCLA Medical Center, Santa Monica; the Resnick Neuropsychiatric Hospital at UCLA; UCLA Mattel Children's Hospital; the UCLA Medical Group and a wide network of primary care and specialty care offices throughout the region, UCLA Health is among the most comprehensive and advanced health care systems in the world. For help choosing a personal physician, call 800-UCLA-MD1.